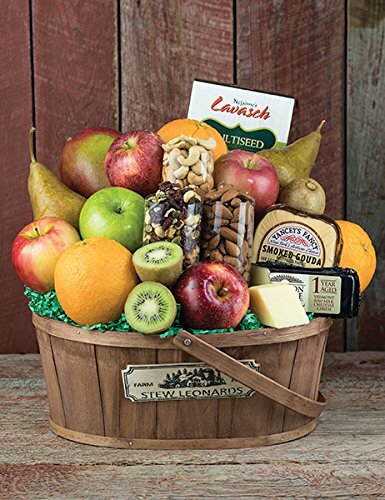 There are tasty snacks aplenty in this selection of eight different farm fresh fruits alongside three types of specialty cheeses and three gourmet nut varieties. All chosen with care by Stew Leonard's for you to share with friends and family, wherever they live. Includes Honeycrisp, Gala, Granny Smith and Fuji Apples, Kiwi, Mango, Oranges, Bosc Pears, Smoked Gouda Cheese, Vermont Cheddar Cheese, Multi Seed Flatbread, Almonds, Cashews and Stew Leonard's famous Cranberry Fitness Mix. Delicious variety of fruits, nuts, and cheeses! Elegantly presented gift to show you care.